You can trust our expert team with all of your marine construction needs. 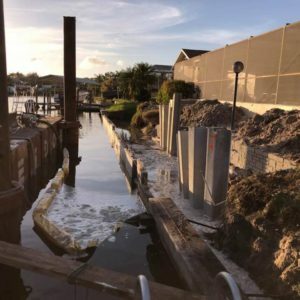 This is because we are one of the only companies in Southwest Florida offering complete in-house service for your docks, seawalls, and tiki huts. Our dedicated crews specialize in building high-quality, long-lasting additions to your property. Whether you have commercial or residential needs, you can trust our skilled tradesmen to get the job done. Browse our services below or check out our reviews here. Your new dock is a legacy you will pass down through generations. 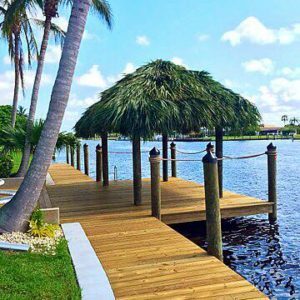 Your custom dock construction should be focused on delivering your dream of the Florida lifestyle. 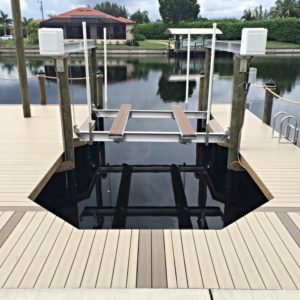 Whether you are looking for commercial or residential docks for play, boating, or fishing; our experts have you covered. You’ve always dreamed of the perfect place to gather outdoors. In your custom-built tiki hut, you will enjoy years of entertaining and a nice shield from the Florida sun. Adding a tiki hut to your dock is a perfect addition to turn your dock into a place all of your guests want to be. Whatever watercraft you own, we can make your lift installation easy. Our team specializes in yacht lifts, boat lifts, or smaller personal watercraft lifts perfect for your jet skis or kayaks. You can rely on our extended warranties and excellent craftsmanship to protect your watercraft investment. Seawalls protect your property and home from damage caused by the elements. Your seawall investment should last for decades. Our skilled seawall crews can construct your new seawall with a focus on withstanding many natural events. No matter the options you choose, we can work with options that fit your budget and timelines. Nature can be cruel. When your seawall is damaged due to natural disaster or age, our team comes to the rescue. 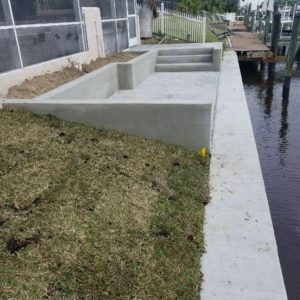 Our skilled craftsman can repair your existing seawall or caps as well as tear out and replace broken panels. Your seawall will look like new when you put repairs in the expert hands of our full-service marine construction team. 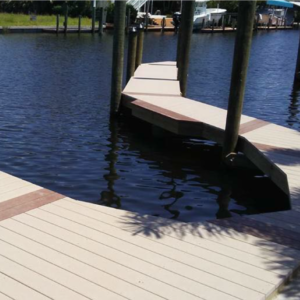 Your dock is used to handling the elements – storms and Florida sun. The colors may fade or wood may warp. Whether you are ready for a redeck or suffered storm damage, our team is equipped to help your dock look better than new. Our team maintains, services, and rebuilds docks. We also offer a range of options and custom work to make it even better than before.